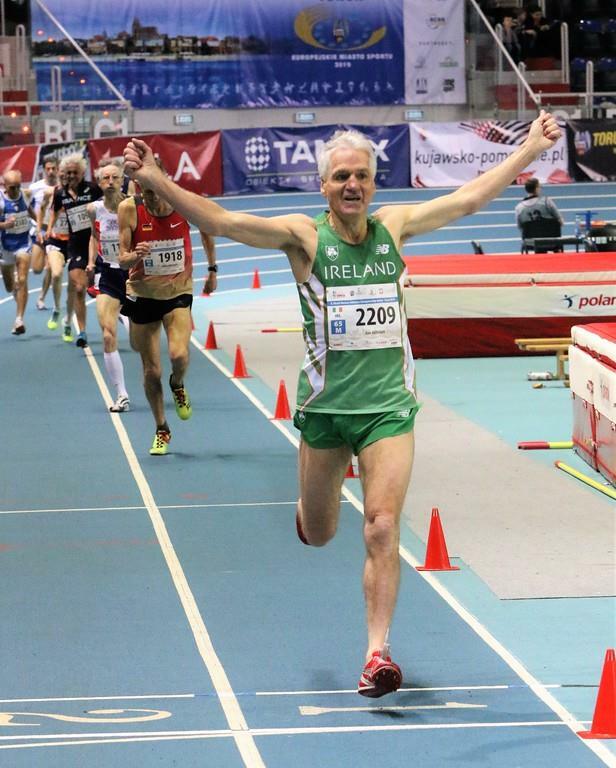 West Waterford AC’s Joe Gough on his way to more World Championships Masters glory in Poland this week. In Torun in Poland this week Joe Gough West Waterford kept up his amazing winning sequence at Major Master’s Championships by winning the World over 65 800m and 1500 metres Indoor titles. In each race of the four races he ran in consecutive days semi finals and finals he ran well planned races as always dictating the way they would be run and making the right calls at the right time in each. Joe who is blessed with good health takes his sport very seriously and trains diligently practically daily runs competitively regularly and keeps himself in great shape and for the most part injury free. On Wednesday Joe easily qualified for the 800 metres final by winning his semi final and automatically qualifying for Thursday’s final. In that final he was always handily placed and made his move at the bell and opened a gap of a few metres on two chasing athletes, then at the final bend he upped the pace and sprinted clear to breast the tape in 2 minutes 22.06 seconds, Water Rentsch Germany was second in 2.24.34 and Kevin Archer Great Britain and Northern Ireland was third in 2.25.52 On Friday he was back on the track in the semi final of the 1500 metres which turned out to be a competitive affair which he won just edging out Kaarla Manninka from Finand who was second with Luciano Moser from Italy third and again automatically going for Saturday morning’s final. In this final he ran a perfect race always in the leading three and at the bell he made his decisive move quickly putting daylight between himself and his nearest pursuers who were the same two who finished second and third behind him in the 800 final, he went clear to win in 4.51.39 beating his Irish record by 14 seconds in the process, Rentsch was second in 4.53.40 and Archer third in 4.53.68. So four races in four days and all four won semi’s and finals for Joe a perfect ending. Incidentally in various ages at the Championships Ireland won a total of 10 gold,18 silver and 13 bronze medals. In Athlone on Saturday and Sunday last there were quite a few medal winners from Waterford at the first two sections of the All Ireland Juvenile Indoor Championships. For Waterford AC Daniel Farrell won the u 16 1500m walk ,silver medals went to Sophie Crowley high jump u 16, Maeve O’Connor u 6 1500m walk in a close finish and Emiy O’Mahony was third in the u 19 60m hurdles. For Ferrybank silver medals went to Jake Bagge u 18 800 and 1500m both in very good times and just behind the winners, Kylie Heinen high jump u 18 with a p.b. and a bronze medal to Katie Nolke u16 high jump again with a p.b. West Waterford had wins with Patrick Fitzgerald u 19 pole vault and Sam O’Neill was second, a third placing went to Ryan McGrath u 18 pole vault while Corey Scanlon Finnisk Valley was second in the u14 shot putt beaten very narrowly. On Friday and Saturday next the Irish University Track and Field Championships are in Athlone and a number of Waterford athletes will be competing for various Universities and Institutes of Technology, the fixture starts on Friday at 2 pm and on Saturday at 9.45 am for the hammer event and at 10.25 am on the track. The final day of the All Ireland Juvenile Indoor Championships goes ahead in Athlone on Saturday next at 10.30am. On the programme are boys and girls relays u12 to u 19 at 4x 200m ,Shot Putts,u17 to u 19, triple jumps u 18 and 19, long jumps u15 and 16 boys and girls and u 17 boys. On Sunday also in Athlone at 11 am the Spring Throws meeting will be held with hammer, javelin and discus events. Two Road Races take place in the county on Friday evening next April 5 th the 6th Annual MTS Media Ballinroad 5 km is at 7pm. It is Race 1 in the Elvery’s series. Entries will be taken in Ballinroad Soccer Club Centre from 5.45pm. In Carbally the Inaugural Martin Halley Memorial 5km goes ahead at 7.30 pm preceded by a Walk at 7 pm. and entries will be taken on the evening in Carbally and it promises to be a great evening of sport and entertainment. Friday 12th Butlerstown 4 miles Race 2 Elvery’s /Asics Series 7pm. Sunday 14 th Ferrybank GAA 10 km 11 am. Friday 19th Faugheen 5 km Race 1 Carrick on Suir Series 7.30 pm. Due to circumstances beyond the control of the organisers please note the 50th Annual Blue Wall Waterford to Tramore Road Race will now revert back to its original date of Saturday April 27 at 7pm from near Waterford City Hall and not on another date which was mentioned last week. The organisers apologise for any confusion that may have arisen, entries now for April 27th at totaltiming.ie. On Saturday next star race walker Kate Veale West Waterford AC competes in an International 20km Race walk in Podebrady in the Czech Republic the event is timed for 1.45 pm Irish time.